It is the dream of millions of kids across the country to play professional baseball when they grow up. But can you imagine if you worked your entire life towards that dream, only to have it shattered in your very first professional game before you even got to step up once to the plate? Such was the sad case of Dustin Fowler, a prospect who got his first shot in the MLB with none other than the Evil Empire themselves – the New York Yankees – in June of 2017. Chasing a foul ball and trying to make a play, Fowler ran at full speed into what appeared to be a padded section of wall during an away game in the ballpark of the Chicago White Sox. However, the section of wall that Fowler unluckily found himself on a collision course for was actually an unpadded electrical box, indistinguishable from its padded wall surroundings. Fowler suffered an injury to his patellar tendon, requiring season-ending surgery and slamming the brakes on his dream that was finally becoming a reality. Rather than wallow in despair and wonder what could have been, Fowler tackled his rehab after successful surgery and went one large step farther – he filed suit against MLB and the White Sox stadium ownership for failing to ensure a reasonably safe work environment, which ultimately caused his injury, pain and suffering and potential loss of significant income. As Michael McCann points out in a recent Sports Illustrated article, professional athletes aren’t likely to pursue legal action against their employers due to a number of reasons. Perhaps they fear public backlash they might receive, perhaps they don’t want to deal with court proceedings and the disruption that could cause to their training regimens. Besides, professional athletes are paid among the highest of employees in the country and have collectively bargained for outstanding health care – so suing to receive financial compensation may not be a top priority either. Most importantly, however, professional athletes don’t often sue following an injury because they assume the risk of injuries when they sign their contract to play professional sports. Had Fowler simply slipped while tracking the foul ball and broke his arm, he’d have no real legal recourse against Major League Baseball, as that situation is one that could be reasonably expected to happen throughout the course of any baseball game, to any player at any position. What makes Fowler’s case unique – and why a federal judge just upheld the case’s right to proceed despite an attempt from the MLB and White Sox to have it thrown out – is because it challenges the notion of what a reasonable assumption of risk is for professional baseball players. The defendants in the case have essentially argued that safety issues within major league ballparks are handled by a specialized safety committee that is charged with addressing potential hazards to players’ health, and that they are not liable for injuries that occur due to safety hazards that aren’t realized and addressed by the committee. However, the judge ruled in favor of Fowler – who argued that the language within the MLB’s collective bargaining agreement with the players’ union only states that the safety committee will address hazardous situations as they arise, and therefore are not expected to safeguard against every potential, unknown safety hazard at every ballpark. If a player were to sue Wrigley Field because they slammed into their famous ivy-covered brick wall, they would be unlikely to succeed, as the brick walls at Wrigley are a well-established, well know feature of the ballpark that is essentially engrained into baseball’s storied history. Players could be expected to know the brick wall exists. America’s game is back in full swing, bringing tens of thousands of people out to bars, tailgates and ballparks throughout the nation to watch their favorite teams play. Although baseball is amongst the slowest-paced sporting events held in America, it poses plenty of risks to those gathered in attendance. The most obvious risk of injury at a baseball game is being hit by a scorching line drive or an errantly-thrown bat that makes its way into the crowd. Baseballs hit by professional players can be traveling a whopping 110 miles per hour, giving anybody precious little time to react to avoid one coming directly at their head. 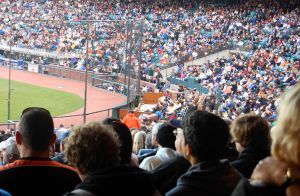 Adding to the very real danger of constant projectiles peppering the stands is the fact that viewing baseball games is, especially today, a viewing experience that is rife with distractions. 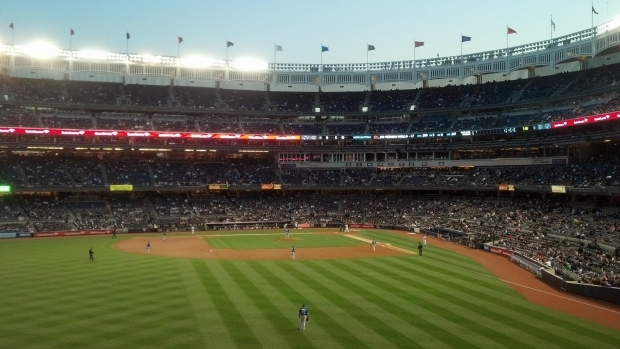 More and more people stay glued to a phone rather than the action – or lack thereof – on the diamond. Maybe you have a hot dog in one hand and a beverage in the other. These distractions make reacting to a ball headed your way even less likely. Besides the risk of injury from balls and bats, baseball parks themselves offer plenty of scenarios that could injure somebody. Some seats sit many stories high in the air, with little protection against falls except for short railings. Falls have claimed the lives of fans in the past, and have injured others. Gatherings of large numbers of people always carry inherent risk of fights, trampling, slips and other various accidents that may result in action being taken against a sporting venue. For instance, a Chicago woman recently filed suit against the stadium of the Chicago White Sox because they allegedly failed to prevent her from tripping over a barricade that protruded into a public walkway. Should an injury at the ballpark happen to you, there are certain situations and circumstances that will help to determine whether or not you have a legitimate claim to receive financial recompense for the harm you have sustained. A Cleveland man was recently denied by a jury in his claim that the Cleveland Indians were negligent in not extending their safety nets far enough along the baseline, which he alleged allowed a ball to hit him in the head and resulted in the loss of vision in one of his eyes. The man had claimed he was being distracted by ballpark personnel who were instructing him to move seats when the ball was hit and struck him. The team had argued that this was not accurate. In this case, hearsay and the uncertainties surrounding the facts of the event most likely sewed enough doubt in the mind of the jury that they couldn’t decide in good conscious whether anybody was directly at fault for the accident. A baseball fan died last night after falling nearly 70 feet from the upper-deck at Turner Field in Atlanta. The incident involving a 30-year old Georgia man occurred around 8:55 p.m. Monday night. Investigators are unsure of why the man fell but believe that the fall was accidental. They have not said whether alcohol was a factor in the fall. This is the second death at a Georgia sports stadium since last year. Last August a Tennessee fan died after he fell 45 feet at the Georgia Dome during a college football game between Tennessee and North Carolina State.